Principal Interaction Design Architect with over 15 years experience in application interaction design. Accomplished expert in interaction design principles including user requirements, conceptual model design, user interface design and user testing. Background in software engineering ensures user interface designs that can be built by the selected team, on the selected technology, and on time. Highly effective communicator, with ability to engage at all levels. User Analysis: Conducting user interviews (pairs approach), creating scenarios and personas, performing acceptance and usability testing. Interaction Modeling: Creating conceptual and interaction models (application and webpage). Applying interaction design principles and heuristics. 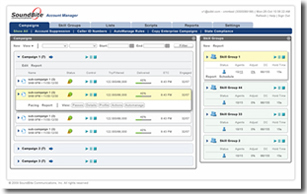 Product Management: Creating product requirements and specifications. Coordinating with the product stakeholders: product management, software engineering, customer service and marketing. User Interface Design: Designing Rich Internet Applications (RIA), Software as a Service (SaaS) and desktop applications. Creating wire frames, mockups, prototypes, and user interface design specifications. Creating effective designs for analytic applications. 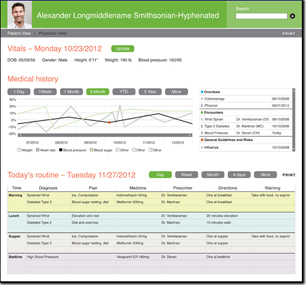 Management tools for the home healthcare team. 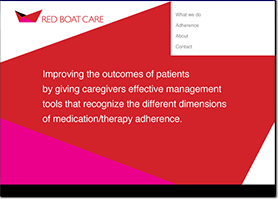 Our goal at Red Boat Care is to improve patient outcomes through better medication/therapy adherence. To achieve that goal we are building a tool for the frontlines of healthcare, patients and their caregiver teams. We leverage our expertise in healthcare services and product design to build a tool that is needed and creates value. Providing interaction and product design consulting services. Our specialty is creating analytic user interface designs for early stage startups. Our services range from user interface design, to interaction design reviews to usability analysis. Our strength is working in Agile environments providing designs that address immediate demands and anticipate future requirements. Our designs are differentiated by their ease of use, extensibility and world-class design quality. Researched user behavior by observing and recording legal technicians in their workplaces. The acquired information defined an interaction information hierarchy and nominal workflow. Defined additional product requirements identified through analysis of user findings. Resulting requirements added either immediately to the product or to the product roadmap. Designed Interaction/User Interfaces for high velocity local/remote development team. Reviewed and deployed designs in collaboration with Product Management, Development (local and remote), Professional Services, QA and the customers. An object-oriented interaction design that restored customer confidence. Highly interactive information retrieval and analysis designs that took full advantage of Silverlight technology. A graphical based conversation network design and novel clustering visualization. Information architecture designs that anticipated future product requirements and accommodated multiple personas. Screen designs that brought product to world class enterprise standards. Researched user behavior by observing and recording system managers in their workplaces. The acquired information informed the interaction design process. Defined product requirements identified through analysis of user findings. Resulting requirements added to product roadmap. Designed Interaction/User Interfaces satisfying the new and existing product requirements. Reviewed and deployed designs in collaboration with Product Management, Development, Professional Services, QA and the customers. Identified, documented and reviewed strategic interaction objectives, including conceptual models and associated product requirements. An object-oriented interaction design that replaced the original inflexible “function-oriented” design. Highly interactive campaign management designs that took full advantage of GWT technology. A graphical based multipurpose calendar design. Information architecture designs that progressively disclosed functionality based on user value. Interaction design language based on reusable components. Researched user behavior by observing and interviewing mechanical designers in their workplaces. The acquired information informed the interaction design process. Coordinated cross-functional input from Product Management, Development, Professional Services, QA and the customers that assured design quality and buy-in. Created Interaction roadmap, including interaction and conceptual models, covered both the target release requirements and interaction designs for future releases, ensuring cross release interaction consistency. Created high fidelity mockups, in Photoshop, to illustrate interaction designs, including nominal workflows. An object-oriented interaction design that replaced the original inflexible “function-oriented” design. A unified editor that presented a consistent user data input experience and required less code. A CAD-like 3D tool based interaction that significantly improved the ease of use over prevailing approaches. A graphical workflow interaction reflecting the user’s process mental model. Future product vision was captured in a special design effort, which was reported directly to the CEO. Performed user task analysis, user interviews and user testing using effective scripts. Acted in a customer-facing role acquiring the user data that informed the quality design. Created high fidelity mockups (in Photoshop) that illustrated interaction designs including nominal workflows. Coordinated graphic design efforts for this world-class enterprise product. Coordinated the cross-functional participation of marketing personnel, graphic designers and developers. Was a hands-on user interaction designer performing a developer role. 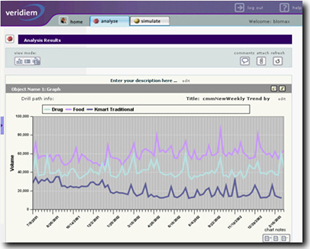 Developed intuitive analytic interactions following a design for usability approach. The designs included an innovative and easy to use analysis creation capabilities. Performed task analysis that revealed workflow issues that were added into to the product’s functional requirements. Ensured conformance to industry standards wherever possible. 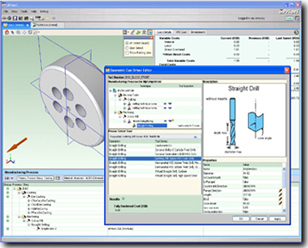 Developed software using Struts, Tiles, and JSP. As an architect/developer, designed and implemented the core web tier components of initial product release. Played the role of both team lead and developer. Designed and implemented project management software application after study of user requirements. The initial prototype of this web application was based on the JBoss 3.1, the Struts Framework and JSP's for the view layer and CMP2.0 session/entity beans for the business/model layers. Developed Swing based administration client for product prototype. Created and implemented graphical authoring tool interaction design that was used to create reusable, scalable, components deployed in streaming pipeline signal processing applications. This Java Swing(JFC) based product incorporated the JGo graphical toolkit. Project lead for this user interface. Responsibilities included writing functional specifications and creating designs that adhered to prevailing UI standards. Wrote 90% of the Java software in a dual role of software engineer and project lead. Used JProbe to diagnose Java memory consumption and performance problems. Implemented a SilkTest based test suite for UI development. 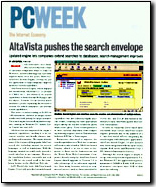 Designed and implemented browser-based Java Swing(JFC) management interface: for AltaVista's Search Intranet Product. Responsible for the functional specification, software architecture, software, and schedule requirements. Project leader role, arbitrating the needs of engineering and usability group. As the cited reviews indicate, design met both of these objectives. See: Internet Week Review..."AltaVista gets kudos for developing an exceptionally intuitive and efficient management facility. ", PC Week Review, Executive Summary... "USABILITY A". Designed and implemented Servlet/Applet based advanced search interface for the AltaVista website. Performed extensive user research in both DEC’s and CMGi's (AltaVista) usability labs. Clients included Lotus ASG and Publishing Corp. Coordinated the efforts of this team as project lead, from design to usability testing. Participated in the usability testing in both the Lotus and Digital usability labs. Designed and implemented a scientific information access prototype; a design that implemented innovative 3D approaches to information display and navigation using Java, VRML, and HTML. University of Washington - M.S.E.E., B.S. Physics, and B.S.E.E. Present Exploration: How to optimally direct my interests in computer science, user interface design, and aesthetics towards the building of commercially successful products. Interaction Design for startups. Dance (Performance Art), videography, and the role of narrative in contemporary art.